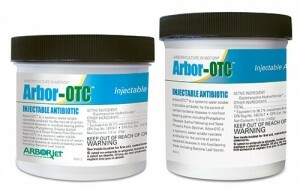 Arborjet’s Arbor-OTC comes available in 1 oz. and 5 oz. containers. Arborjet released Arbor-OTC, an injectable, systemic antibiotic, to enhance the health of non-food bearing palms and trees. According to the company, this product delivers an antibiotic punch via trunk injection into the tree’s xylem, where it is taken up by the vascular system and distributed throughout the plant to suppress disease-causing bacteria. The injection stays inside the tree, protecting the tissue when the bacterial disease is present. Arbor-OTC comes available in 1 oz. and 5 oz. containers. It is designed to treat diseases such as Bacterial Leaf Scorch, Fire Blight, Lethal Yellowing and Texas Phoenix Palm Decline, Ash Yellows, Bacterial Blast, Bacterial Blight, Bacterial Canker, Blossom Blast, Blossom Blight and Canker, Bunch Disease, Crown Gall, Decline, Fruit Spot, Leaf and Shoot Blight, Leaf Blight and Brown Rot, Leaf Spot, Lethal Decline, Phloem Necrosis, Stem Canker, Stubborn Disease, Tip Dieback, Vascular Yellows, Wetwood/Slime Flux, Witches’ Broom and X-Disease. 1 Comment on "Arborjet launches Arbor-OTC to enhance tree health"